Alrighty folks, The Corpse Cast is officially off and running hitting the first milestone of 10 episodes! This episode, we talk about Left For Dead, a band from right here in Salt Lake City. 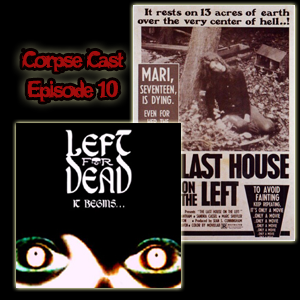 We also talk about Wes Craven’s 1972 exploitation classic Last House on the Left. Though we don’t talk about the remake in detail, we do some comparing and contrasting of the two versions. Finally, for this episode we offer a sweet price for anyone who call in and give us their answer to the Question of the Episode… but you have to listen for details.